And now for something completely different. While I’ve never participated in The Weekly Photo Challenge before, the theme “Geometry” this week spoke to me. This week’s challenge “is about the shapes and rhythms that make up the geometry of our world.” This week, I have found the normal shapes and rhythms of my world disrupted. In the midst of a major storm in the East and a bitter, divisive election, we buried my grandmother this week. She was 98, so it shouldn’t have been a surprise, but it kind of was. This week I have found myself almost longing for a bit of predictability, a return to normal patterns and rhythms. A rational ordered life; a practical science made up of points, lines and planes. I find myself searching for theorems that explain life and loss the way geometric formulas allow you to compute volume, surface and area. Of course, contemporary geometry goes well beyond Euclidean principles, taking us into contemplation of multiple dimensions and space. This also fits with thoughts of life and death. Maybe I’ll think on that later. But in this week of turmoil and endings, I find comfort in what the early Greek mathematicians Euclid and Archimedes called γεωμετρία. Geometry. I took this picture recently on the Greek island of Hydra. When I look at it, I can’t help feeling that the early Greek geometers were right: there is some order in the world and we can figure it out. And it is all going to turn out just fine. For more entries to this week’s challenge: Geometry click here. Mind The Gap: Would You Bring Your Child(ren) To Work? I myself have turned to the clarity and precision of Geometry and Calculus during times of grief and confusion. For me, it was more of a question of emotional survival until I could get to the place and time when I was ready to grieve. Staa paa. You Mathemagicians are definitely onto something. Thanks for your comment, kjære! Thanks! I look forward to checking it out! geometry with an amazing view! 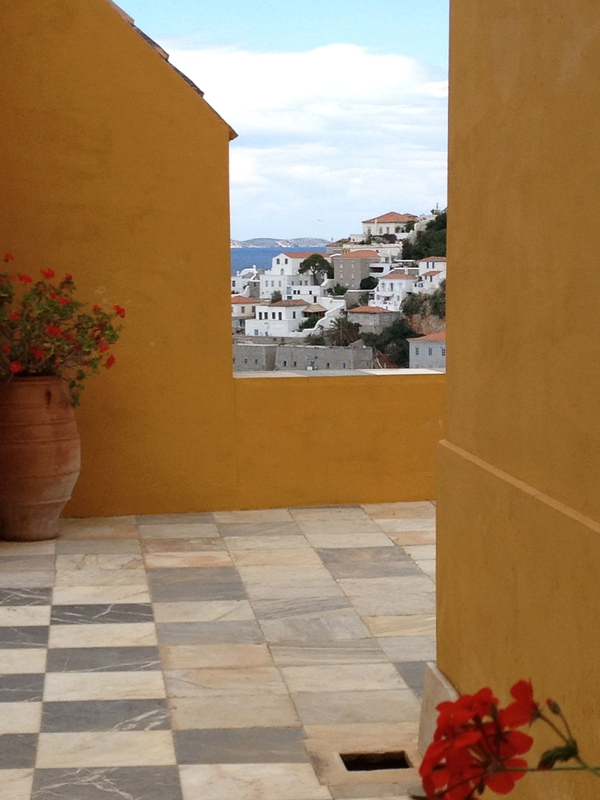 Yes, this was taken during a visit to a historic house/museum in the port of Hydra. Gorgeous! Wish I had had a better camera as this was taken with my iPhone. Thanks so much for your comment! Thanks, Nicole! As you know, my blog is a work in progress…slow, but still progress. I feel so lucky to have had my grandparents in my life for as long as I did – and especially that my kids had a chance to know them, too. Thanks for your comment!